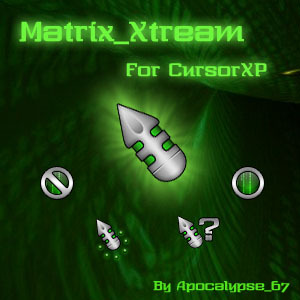 Cursor to complement the Matrix_Xtream Theme. A-67 Another awesome cursor.. Ya know..I recently was going through my files cleaning out the stuff I do not use much and I was amazed at how much of your stuff I have!..Apparently I seem to like ALOT of your work! Thanks a bunch for sharing and keep up the Awesome! work!! Apoc_67, Yet another great design....been using it with the MX wb skin & works like a charm! Great Theme! 5 STARS! Perfect design. I give it a 10. This is really good. Like all of you other stuff, excellent!! Thank you Blackon for your comment. Thank you Pixtudio. The comment is a great complement coming from you. When will wincustomize fix the .zip file conversion problem? Yet another cursorxp theme i would love to try out, but cant! I cant get my XP to get the cursons in, how do u do that?